Developed by Bugatti: This eight-piston monobloc brake caliper is the world’s first brake caliper to be produced by 3-D printer and also the largest titanium functional component produced by additive manufacturing. © 2018 Bugatti Automobiles S.A.S. This brake caliper is the largest titanium functional component produced by 3-D printing in the world – developed by Bugatti. The photo shows the caliper together with pistons and pads. © 2018 Bugatti Automobiles S.A.S. Frank Götzke, Head of New Technologies in the Technical Development Department of Bugatti Automobiles S.A.S. © 2018 Bugatti Automobiles S.A.S. With its Veyron and Chiron super sports cars, Bugatti has established a position as a pioneer for new technical developments and innovations in the extreme performance sector of the automotive industry over the past few decades and has set breathtaking performance data and records. Now the Development Department of the French luxury brand has achieved a new coup. For the first time, the Bugatti developers have succeeded in designing a brake caliper that can be produced by 3-D printing. But that is by no means all. While the main material used for the additive production of vehicle components to date has been aluminium, the new brake caliper is made from titanium. This is therefore the world’s largest functional component produced from titanium using 3-D printing processes. This new milestone in the development of 3-D printing was reached in cooperation with Laser Zentrum Nord of Hamburg, an institute that has formed part of the Fraunhofer research organization since the beginning of the year. With this world debut, Bugatti has underlined its lighthouse function for 3-D printing within the Volkswagen Group and its role as an innovation driver in the international automotive industry. Vehicle trials for the use of the 3-D titanium brake caliper in series production are to start in the first half of the year. Götzke has worked for the Volkswagen group for more than 22 years. He joined Bugatti in 2001 and played a key role in the development of the Veyron as Head of Chassis Development and in the development of the Chiron in his current position. Bugatti currently uses the most powerful brakes in the world on the new Chiron. The brake calipers were an entirely new development. They are forged from a block of high-strength aluminium alloy. With eight titanium pistons on each of the front calipers and six on each of the rear units, these are also the largest brake calipers currently installed on a production vehicle. The brake calipers of the Chiron are produced using bionic principles on the basis of a natural model. The new architecture combines minimum weight with maximum stiffness. The inspiration for the design and mode of operation of the brakes was taken from motorsports. With the newly developed titanium brake caliper from the 3-D printer, Bugatti is now going one step further and breaking new ground. This particular titanium alloy, with the scientific designation of Ti6AI4V, is mainly used in the aerospace industry, for example for highly stressed undercarriage and wing components or in aircraft and rocket engines. The material offers considerably higher performance than aluminium. For example, even as a 3-D printed component, it has a tensile strength of 1,250 N/mm2. This means that a force of slightly more than 125 kg be applied to a square millimetre of this titanium alloy without the material rupturing. The new titanium brake caliper, which is 41 cm long, 21 cm wide and 13.6 cm high, weighs only 2.9 kg. In comparison with the aluminium component currently used, which weighs 4.9 kg, Bugatti could therefore reduce the weight of the brake caliper by about 40% at the same time as ensuring even higher strength by using the new part. To date, this approach was not feasible because it is extremely difficult or even impossible to mill or forge components from a titanium block as is normal practice with aluminium due to the extremely high strength of the material. This problem has now been solved using an extremely high-performance 3-D printer, which also opens up the possibility of generating even more complex structures which are significantly stiffer and stronger than would be possible with any conventional production process. Frank Götzke found the selective laser melting units required in Hamburg, at Laser Zentrum Nord. “Laser Zentrum Nord is one of many scientific institutes with which we have developed very good cooperation over the years,” Götzke explains. “Thanks to the large number of projects completed, mainly for the aviation industry, the institute has comprehensive know-how especially in the field of titanium processing and offers mature technology.” Over the past few years, the Hamburg production scientists have received a large number of highly regarded national and international innovation awards for their work in industry. The development time for the 3-D-printed titanium brake caliper was very short. From the first idea to the first printed component, it only took about three months. The basic concept, the strength and stiffness simulations and calculations and the design drawings were sent to Laser Zentrum Nord by Bugatti as a complete data package. The institute then carried out process simulation, the design of the supporting structures, actual printing and the treatment of the component. Bugatti was responsible for finishing. The special 3-D printer at Laser Zentrum Nord, which was the largest printer in the world suitable for titanium at the start of the project, is equipped with four 400-watt lasers. It takes a total of 45 hours to print a brake caliper. During this time, titanium powder is deposited layer by layer. With each layer, the four lasers melt the titanium powder into the shape defined for the brake caliper. The material cools immediately and the brake caliper take shape. The total number of layers required is 2,213. Following the completion of the final layer, the remaining titanium powder which had not melted is removed from the chamber, cleaned and preserved for reuse in a closed loop. What remains in the chamber is a brake caliper complete with supporting structure which maintains its shape until it has received stabilizing heat treatment and reached its final strength. Heat treatment is carried out in a furnace where the brake caliper is exposed to an initial temperature of 700°C, falling to 100°C in the course of the process, in order to eliminate residual stress and to ensure dimensional stability. Finally, the supporting structures are removed and the component is separated from the tray. In the next production stage, the surface is smoothed in a combined mechanical, physical and chemical process which drastically improves its fatigue strength, i.e. the long-term durability of the component in later vehicle operation. Finally, the contours of functional surfaces, such as the piston contact surfaces or threads, are machined in a five-axis milling machine which takes another 11 hours to complete its work. The result is a delicately shaped component with wall thicknesses between a minimum of only one millimetre and a maximum of four millimetres. The first trials for use in production vehicles are due to be held in the first half of the year; the time schedule is still to be finalized. At that stage, the engineer promises that it will be possible to considerably shorten production times, especially for machining. 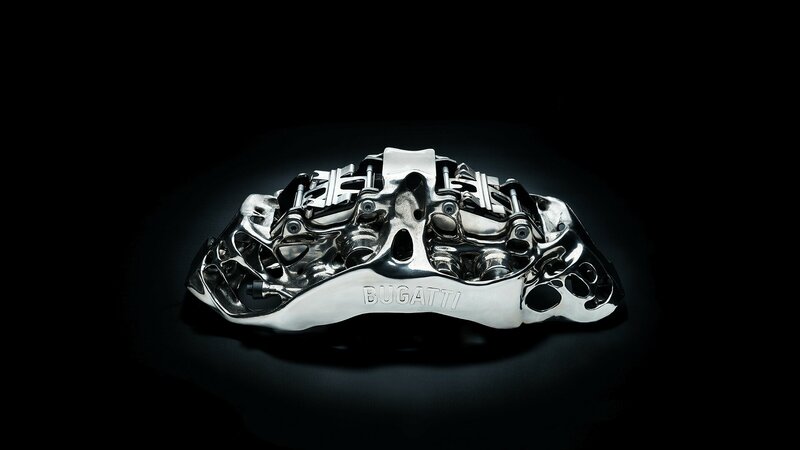 The 3-D-printed titanium brake caliper is only one example of Bugatti’s current research and development work. “We have not only developed the world’s largest titanium component produced by additive manufacturing but also the longest aluminium component to date made by 3-D printing,” Götzke explains, proudly taking a 63-centimetre-long lightweight aluminium windscreen wiper board out of the cabinet. The board only weighs 0.4 kg, half the weight of a conventional die-cast lightweight aluminium board, without any reduction in rigidity. But that is another story.